True to form, another career politician in Congress is preparing to be indicted on federal charges. These elected officials just can’t seem to keep their hands out of the cookie jar. This time, it’s 12-term Florida Congresswoman Corrine Brown. Brown frequently runs unopposed for re-election or wallops her only opponent by 30-40 points. Her district was one of the most gerrymandered in America before a judge ordered its “bizarre shape” be redrawn. Now Brown will face charges regarding “One Door for Education,” a fraudulent charity which raised $800,000 for education, then only disbursed one student scholarship for $1,000. Meanwhile, the charity’s money was spent on lavish parties in Washington, D.C. and luxury skyboxes at NFL games. Lifestyles of the rich and elected, apparently. This raises a question for the American people: Why do members of Congress only leave office on occasion of indictment, retirement or even death? That is evidence of a broken system which protects the powerful and excludes everybody else. It must be fixed. If Corrine Brown had faced the six-year term limit prescribed by the U.S. Term Limits amendment, she would have left the House of Representatives in 1999. Instead, she was given 17 more years to build power within the system and connections with special interests outside of it. We need to clean up the corrupt mess in D.C. as soon as possible. It will require a grassroots army of volunteers pressuring state legislators to pass resolutions for the Term Limits Convention. Are you ready to join this grassroots army to fight for term limits? Sign our Super Activist Sign-up Form by clicking HERE. 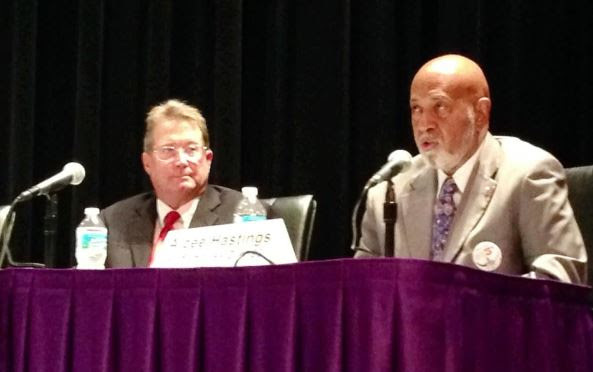 When 22-year Congressman Alcee Hastings (D-FL) claimed members of Congress were underpaid at $174,000 per year, the phone lines here at U.S. Term Limits lit up. We had people from all across America call to tell us how Hastings’ out-of-touch comment solidified in their minds that now is the time to term limit Congress. One man baffled by the remark was Jay Bonner, who ran for Hastings’ District 20 seat last year and is doing so again in 2016. Bonner, the first candidate of the 2016 cycle to sign our term limits pledge, told USTL in an exclusive interview that Hastings’ demands look silly when compared to how people in his district really live. Polls show that most Americans agree, and want Congress to take action on term limits. The only way to get there, however, is by building up a nationwide network of supporters that can pressure our legislators into doing the right thing. That starts with you. As a personal favor to me, please forward this email to five friends or family members who, like you, want to hold Congress accountable. Legislators might be out-of-touch, but the more we get in touch with fellow term limits supporters, the closer we’ll be to achieving our goal. Term limits are highly popular with Florida voters and has recently been gaining attention in Lee and Collier counties causing the three candidates for Congressional District 19 to weigh in on the issue. Yesterday, June 3, 2014, Libertarian Ray Netherwood stated that he supports a Term Limit Amendment of three terms for those in Congress. Republican Curt Clawson nor Democrat April Freeman offered to comment on the issue when an email was sent to their campaigns requesting such yesterday. Boca Raton, FL – Karl Dickey, candidate for Palm Beach County Commission in District 4 [Mary McCarty’s old seat], was instrumental in bringing term limits to the voters which he feels will help our county commission operate in an ethical manner in the future. Mr. Dickey served on the Palm Beach County Term Limits Committee which was successful in putting the issue on the ballot for the voters even though many county commissioners were aggressively opposed to it. The measure passed overwhelmingly by over 70% of the voters in Palm Beach County. Boca Raton, FL – Former Palm Beach County Commissioner, Mary McCarty, was sentenced this morning to 42 months in prison plus a $100,000 after pleading guilty to Honest Services Fraud. Recent years have been difficult for Palm Beach County citizens as they have had to deal with scandal after scandal. In July of 2008, Mary McCarty was speaking in regard to her successor saying, “…someone should come in with new ideas. People want us to continue all services without paying for it.”1 Mr. Dickey has been putting forth new ideas and some can be found at his campaign website www.karldickey.org/issues.htm. Karl Dickey is the only candidate filed to run for Mary McCarty’s seat in the November, 2010 election. Mr. Dickey was instrumental in bringing term limits for county commissioners to voters which passed overwhelmingly.